Imagine waking up in a mass grave - with no memory of who or where you are. 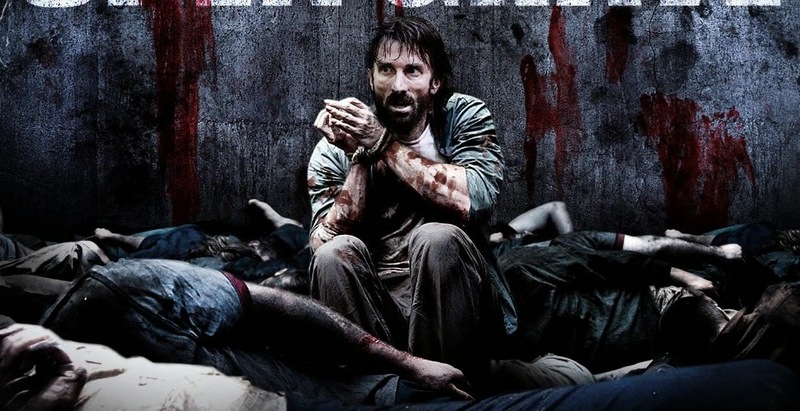 It is the aftermath of this grim, terrifying concept that director Gonzalo López-Gallego (Apollo 18) and stars Sharlto Copley and Thomas Kretschmann present us with in Open Grave. After waking up in the wilderness in a mass grave, an amnesic man (Copley) meets a band of survivors staying in an abandoned mansion. This group are survivors of a deadly outbreak that has turned the population into violent, flesh-hungry fiends. Instead of launching us straight into the zombie pandemonium like so many others in the genre do, Open Grave is refreshing as it spends a reasonable amount of time crafting its bleak, unsettled atmosphere. Feeling part who-dunnit, part-zombie-flick, Eddie and Chris Borley's narrative sets up a number of intriguing questions to hook us in - with the earlier scenes which focus on the feuding paranoid survivors even feeling like a gritty update of an Agatha Christie text. Much of this intrigue takes a backseat in favour of zombie-themed chaos which takes over later in the narrative. Lopez-Gallego adds enough gruesome set-pieces and tense chases into the mix to ensure the film's pulse remains relatively quick for the most-part. There is an occasionally inventive grisliness in many of these set-pieces - such as a scene which sees a zombie tangled up in barb wire, which is enough to turn the stomach. However, much of the horror of Open Grave will have left you by the film's conclusion - largely feeling forgettable and generic. There is much to be admired in the bleak and sparse visuals used by cinematographer José David Montero which helps turn the countryside setting into a unsettled, troubling landscape. Other redeemable assets come in the form of the twists and turns in the Borley's screenplay - featuring an inventive conclusion that tips much of the film's events on their head. Open Grave is a generally satisfying watch. López-Gallego's crafts several inventive spins throughout this bleak tale to ensure viewers remain curiously engaged throughout. Open Grave does present some moderately effective set-pieces, despite occasionally relying on generic tropes of the zombie/infection film. Open Grave is available now.